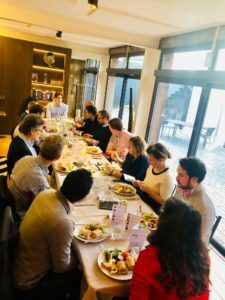 On Tuesday 22nd January, Frog kicked off the year with our first event – a lunch co-hosted in our offices alongside Innovate Finance, the membership association representing UK’s FinTech community. The event was centered around the fundraising challenges companies face as they scale towards Series B and beyond and, more specifically, how these differ from earlier rounds. We were joined by several CEOs from some of the UK’s most exciting FinTech companies, including Abe Smith, who successfully led Dealflo past Series B and through to an eventual exit last year. Given the quality of the questions and thoughts raised, we thought we would jot down some of the key takeaways from the afternoon. Fundraising is relatively high touch and a “sales cycle” (i.e. the entire process) can take up to six months. Like in B2B, it is important to identify your ICP (Ideal Customer Profile) and understand which VCs you want to target. Are you based in the right geography? Have they made investments in similar areas to you? Do they have the ability to write a cheque that will meet your business needs? By doing this work upfront, you can take weeks or months out of the entire process. This is far easier said than done because, realistically, how much time can you afford to devote to this? However, there is value in meeting regularly with VCs or other sources of funding. Even doing so every 3-6 months, for a 30-minute coffee helps to create a relationship and removes the immediacy and transactional feeling of the “courtship” for the couple of months prior to investment. Building a good level of trust and understanding with selected VCs going into a fundraising process can be incredibly helpful. There is conflicting advice about spending time with more junior members of the VC. In our experience, this is an effective, and often easier, way into the firm. However, it’s important to understand which processes the person you’re speaking to has to undertake next. Later stage funds typically have more defined processes, and your contact will likely have to write a report or pitch your business to the rest of their team. Ensure to give them as much ammunition as you possibly can – and clarify where they think there may be internal objections (e.g. because of market size or business model) and see if you can give your contact the answers they’ll need. This is important as later stage funds are more likely to have decisions made by consensus (as opposed to earlier stage funds which may give Partners more autonomy). Thank-you to all the CEOs who joined us for sharing their insights on this subject. We look forward to hosting another event with Innovate Finance in the near future.